A spokesperson for the North American Aerospace Defense Command (NORAD) confirmed this week that a fleet of Russian bombers set off alarms in the United States after coming within 50 miles of California’s Pacific coast. Navy Capt. 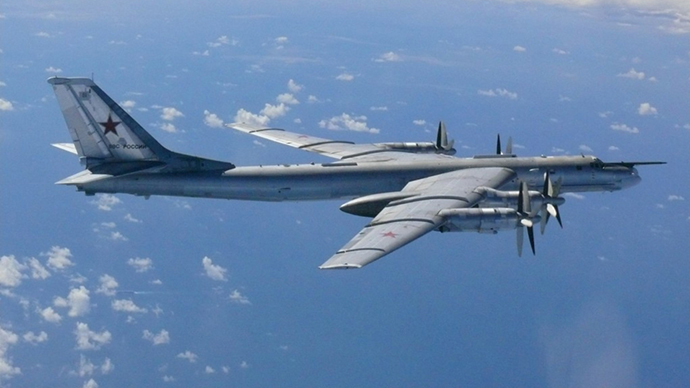 Jeff Davis, a spokesman for NORAD, told Washington Free Beacon reporter Bill Gertz that a pair of Tu-95 Bear H aircraft maintained by Russia came close to US airspace during practice bombing while four of the planes were conducting bombing runs near Alaska. According to Nuclear Threat Initiative nonprofit organization, Russia has 29 Tu-95 MS6 Bear H6s and 30 Tu-95 MS16 Bear H16s, which are equipped to fire both traditional and nuclear payloads at targets from the air. David told the Beacon that this week’s incident occurred on Monday afternoon and was caught quickly by radar systems that monitored American air defense zones. The radar spotted all four Russian aircraft, he said, and two F-22 fighter jets used by the US Air Force were then mobilized to intercept the bombers. “After tracking the bombers as they flew eastward, two of the four Bears turned around and headed west toward the Russian Far East,” Gertz wrote. “The remaining two nuclear-capable bombers then flew southeast and around 9:30 P.M. entered the US northern air defense zone off the coast of Northern California. Those two aircraft, he added, made it within 50 miles of the coast before turning around. The pilots, Davis told the Beacon, appeared to have “acted professionally” and that their behavior was on par with activity that’s “not unusual” for long-range aviation training missions typically conducted by Russia during the summer months. Indeed, in recent weeks other Russian-owned Tu-95 bombers skirted UK airspace and have come close to US property in both Guam and California, The Aviationist reported last month. In March, Russia’s daily Nezavisimaya Gazeta, said the nation’s Strategic Missile Forces began a three-day drill to make sure there was sufficient readiness to conduct a nuclear offensive. Earlier this week, Russian drills intensified when the nation’s military began exercises in the Baltic that the Defense Ministry said was a response to recent exercises in eastern Europe conducted by NATO forces. Allied nations currently maintain a presence there, much to the chagrin of Moscow, as tensions along Ukraine’s border with Russia remain high.